August 24, 2011 - In response to the famine in Somalia, FedEx Express, a subsidiary of FedEx Corp. and the world’s largest express transportation company, delivered yesterday approximately 91 metric tons (200,000 pounds) of high-nutrient food to Nairobi, Kenya. The charitable initiative was organized in collaboration with UNICEF with the aim of offering life-saving assistance to severely malnourished children in south and central Somalia. 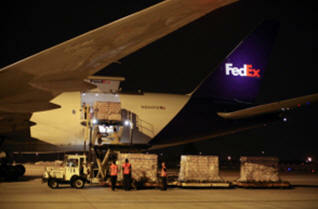 To complete the large-scale humanitarian mission, FedEx used a Boeing 777F aircraft. The relief aid shipment coincides with the company’s announcement to donate an additional 777F relief flight. The in-kind donations currently make FedEx the single largest provider of philanthropic air lifts of aid for UNICEF in response to the famine in Somalia. Together the loads will treat over 6,000 severely malnourished children and provide fortified food for 4,000 families for two weeks. The Boeing 777F aircraft departed Paris Saturday evening and arrived in Nairobi the following morning. Thestate-of-the-art, fuel-efficient aircraftis the world’s largest twin-engine cargo aircraft. With a larger payload capacity, the 777F aircraft providesa greater injection of aid in a single trip than many other airplanes. The modern 777F carries 14,000 more pounds of goods and also uses 18% less fuel than the MD-11, making it an efficient way to deliver aid when disaster strikes. UNICEF is currently transporting the aid into Somalia, ensuring that the relief shipment reaches those children most deeply affected by the crisis. FedEx Express maintains a longstanding commitment to disaster relief. The company donated more than five million pounds (approximately 2,300 tons) of charitable shipping last year alone. “The crisis in the Horn of Africa calls for a prompt and unwavering response. I am both humbled and honored that FedEx can lend its robust logistics expertise and global transportation capabilities to help UNICEF to bring much-needed relief to the children of this region.” said Gerald P. Leary, president, FedEx Express Europe, Middle East, Indian Subcontinent and Africa. “An estimated 2.3 million children are suffering from malnutrition in the Horn of Africa,” said Tim Hunter, deputy director, fundraising, UNICEF. “We are grateful to FedEx for the company’s generosity. The life-saving food supplies will reach some of the most vulnerable children whose lives UNICEF and partners are working hard to save." An urgent multi-sectoral response is being mounted to contain the spread of cholera with an increasing number of confirmed cases in Mogadishu and reports of growing numbers of acute watery diarrhea in the port city of Kismayo. Some 75 per cent of all cases of highly infectious acute watery diarrhea are among children under the age of five. Poor sanitation conditions, a shortage of safe water, overcrowding and high malnutrition rates are the perfect combination for infectious diseases, such as cholera and pneumonia, to spread and increase death rates. Cholera is confirmed in Banadir, Bay, Mudug and Lower Shabelle regions and the number of acute watery diarrhea cases has increased dramatically in the last few months. Since January this year, some 4,200 cases of acute watery diarrhea/cholera were reported in Benadir Hospital in Mogadishu alone. However, at this stage most of the cholera cases in the various regions are contained and under control. “We urgently need more mobile clinics that will provide basic health care services to the many displaced and who will strengthen the reporting on new outbreaks. This is critical to our response and our ability to save lives,” she added. Cholera is endemic in Somalia but the last major outbreak was in 2007 with 67,000 cases. In recent years, efforts to chlorinate the water supply of Mogadishu, along with efforts to improve hygiene and sanitation prevented a serious outbreak. But there is now an acute shortage of safe water and adequate sanitation with the influx of 100,000 people this year into Mogadishu, bringing the total number of displaced people in the capital to 470,000 with many living in overcrowded settlements. Emergency diarrheal disease kits made up of medical supplies such as syringes, infusions, and oral rehydration salts (ORS), already prepositioned by UNICEF and WHO, have been sent to 13 hospitals. An additional 200 diarrheal disease kits, each able to treat 100 severe and 400 moderate cases are being procured and should be in southern Somalia in the next few weeks. These items would enable partners in the health and in the water and sanitation sectors to respond to up to 100,000 cholera cases including 80,000 moderate and 20,000 severe cases. In addition, case management of severe dehydration with and without malnutrition is being strengthened and the focus is now on mobilizing a network of community health promoters to move from door to door with health hygiene education messages. Health posts are being stocked with essential medicines and ORS. Many of southern Somalia’s rural and urban areas rely on shallow wells, which - unless they are protected or treated with chlorine - can be a perfect breeding ground for water-borne diseases. Partners in the water, sanitation and hygiene sector are scaling up to target 1.5 million people across high risk areas of the South. Supplies of chlorine and essential items for hygiene and household treatment and storage of water are being distributed. Already 217 water sources are being chlorinated, and 58 water point outlets are benefitting 483,200 people in Mogadishu. In addition, household hygiene supplies, including water purification tablets, soap and buckets, enough for 48,000 families, are being distributed at existing feeding centers for malnourished children. Campaigns to educate families about the treatment of drinking water, safe disposal of waste and encourage hand washing with soap will also be scaled up in high risk communities. As part of the updated 2011 UN Consolidated Appeal for Somalia, an estimated $80 million is needed for the health sector and $78 million is required for the water, sanitation and hygiene sector. So far only 30 per cent and 37 per cent respectively has been raised for each sector.